Clearly, H2O absorbs more than ten times the amount of energy in the IR spectrum as does CO2. Furthermore, H2O is more than one hundred times more abundant in the atmosphere than CO2. The conclusion is that H2O is more than one thousand times as potent a greenhouse gas (GHG) as CO2.With such immutable facts facing the EPA, how will they explain their stance that CO2 is a greater danger to the public than water vapor? But in wondering why they hadn’t, it did occur to me that non-linearity is something that most people struggle with. Or don’t struggle with because they’ve never heard of it. I think that the non-linear world we live in is not really understood because of the grocery factor..
(And it would be impolite of me to point out that Dexter didn’t know how to interpret the transmittance graphs he showed). Dexter is in the supermarket. His car has broken down so he walked a mile to get here. He has collected a few groceries but his main buy is a lot of potatoes. He has a zucchini in his hand. He picks up a potato in the other hand and it weighs three times as much. He needs 100 potatoes – big cooking plan ahead – clearly 100 potatoes will weigh 300 times as much as one zucchini. Carrying them home will be impossible, unless the shopping trolley can help him negotiate the trip..
Perhaps this is how most people are thinking of atmospheric physics. What is the author talking about? Perhaps I can dive into some simple maths to explain. I usually try and avoid maths, knowing that it isn’t a crowd-puller. Stay with me..
Not so hard? This is a linear problem. If you change the weight (or number) of potatoes the change in total is easy to calculate because we can ignore the number and weight of zucchinis to calculate the change. What happens when we halve the number of potatoes? It’s much harder to work out because the term on the left depends on the number of zucchinis and the number of potatoes (squared) and the term on the right depends on the number of potatoes and the number of zucchinis (cubed). So the final result from a change in one variable could not be calculated without knowing the actual values of the other variables. This is most real-world science/engineering problems in a nutshell. When we have a linear equation – like groceries but not engineering problems – we can nicely separate it into multiple parts and consider each one in turn. When we have a non-linear equation – real world engineering and not like groceries – we can’t do this. It’s the grocery fallacy. Science and engineering does not usually work like groceries. In many blogs, the role of water vapor in the atmosphere (usually the troposphere) is “promoted” and CO2 is “diminished” because of the grocery effect. Doing the radiative transfer equations in your head is pretty difficult, no one can disagree. But that doesn’t mean we can just randomly multiply two numbers together and claim the result is reality. A recent (2010) paper, Contributions of Stratospheric Water Vapor to Decadal Changes in the Rate of Global Warming by Solomon and her co-workers has already attracted quite a bit of attention. This is mainly because they attribute a significant proportion of late 20th century warming to increased stratospheric water vapor, and the last decade of cooling/warming/pause in warming/statistically significant “stuff” (delete according to preferences as appropriate) to reduced water vapor in the stratosphere. (If you are new to the subject of the stratosphere, there is more about it at Stratospheric Cooling and useful background at Tropospheric Basics ). There is much that is interesting in this paper. Firstly, take a look at the basic physics. The graph on the left is the effect of 1ppmv change in water vapor in 1km “layers” at different altitudes (from solving the radiative transfer equations). 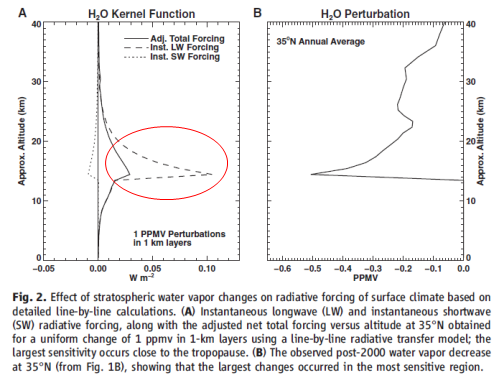 Notice the very non-linear effect of “radiative forcing” of stratospheric water vapor vs height. This is a tiny 1ppmv of water vapor. Higher up in the stratosphere, 1 ppmv change doesn’t have much effect, but in the lower stratosphere it does have a significant effect. Very non-grocery-like behavior.. It looks as though the major (recent) changes have occurred in the most sensitive region – the lower stratosphere. Because of a lack of global data, we have considered only the stratospheric changes, but if the drop in water vapor after 2000 were to extend downward by 1 km, Fig. 2 shows that this would significantly increase its effect on surface climate. The calculations done by Solomon compare the increases in radiative forcing from changes in CO2 with the stratospheric water vapor changes. 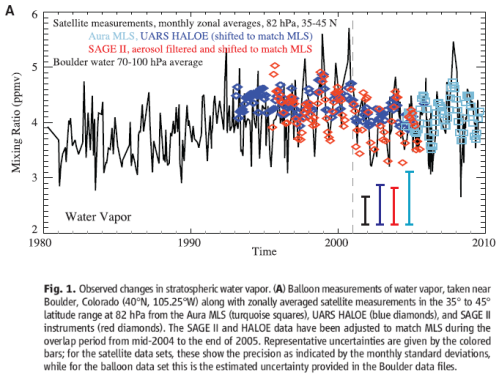 The range in the 1980-1996 number for stratospheric water vapor reflects the lack of available data. The upper end of the range comes from the assumption that the changes recorded at Boulder are reflected globally. The lower end that there has been no global change. What Causes Stratospheric Water Vapor Changes? Methane oxidation has a small contribution near the tropopause – the area of greatest effect – and the paper comments that studies which only consider this effect have, therefore, found a smaller radiative forcing than this new study. Water transport across the tropopause – the coldest point in the lower atmosphere – has of course been studied but is not well-understood. Is this effect something just discovered in 2010? 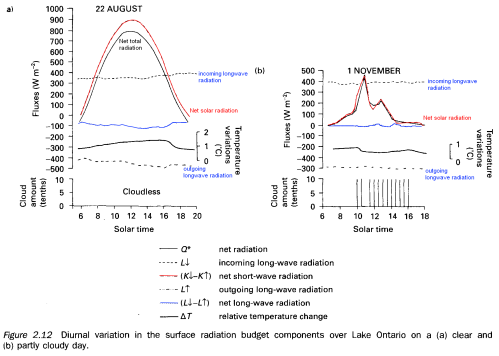 This study shows how increases in stratospheric water vapour, inferred from available observations, may be capable of causing as much of the observed cooling as ozone loss does; as the reasons for the stratospheric water vapour increase are neither fully understood nor well characterized, it shows that it remains uncertain whether the cooling of the lower stratosphere can yet be fully attributable to human influences. In addition, the changes in stratospheric water vapour may have contributed, since 1980, a radiative forcing which enhances that due to carbon dioxide alone by 40%. 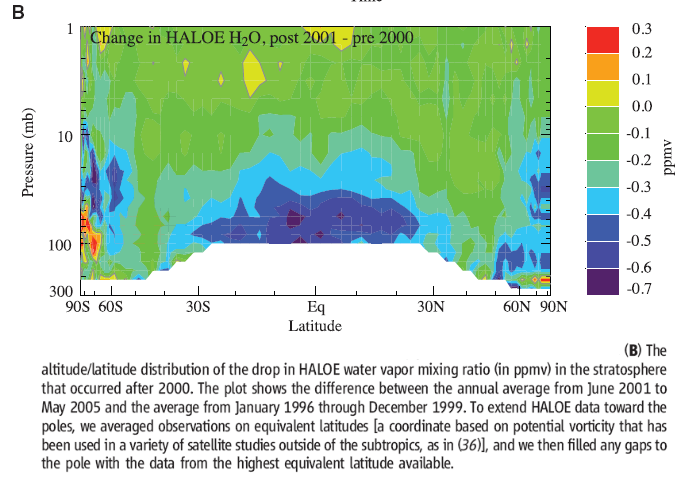 A positive trend in stratospheric H2O was first observed in radiosonde data [Oltmans and Hofmann, 1995] and subsequently in Halogen Occultation Experiment (HALOE) data [Nedoluha et. al., 1998; Evans et. al., 1998; Randel et. al., 1999]. The magnitude of the trend is such that it cannot all be accounted for by the oxidation of methane in the stratosphere which also show increasing trends due to increased emissions in the troposphere. This leads to the hypothesis that the remaining increase in stratospheric H2O must originate from increased injection of tropospheric H2O across the tropical tropopause. 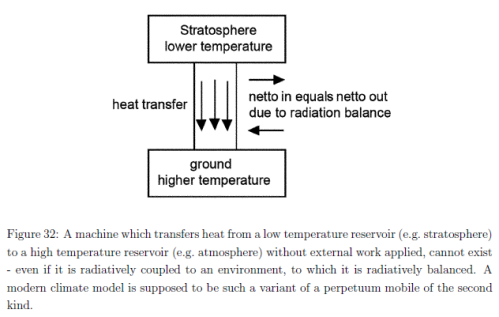 It should be useful to evaluate the effect of the variation of stratospheric water vapor upon the thermal equilibrium of the atmosphere, with a given distribution of relative humidity.. The larger the stratospheric mixing ratio, the warmer is the tropospheric temperature.. The larger the water vapor mixing ratio in the stratosphere, the colder is the stratospheric temperature.. The potential role of stratospheric water vapor on climate is not a new understanding – but finally there are some observations which can be used to calculate the effect on the radiative balance in the climate. 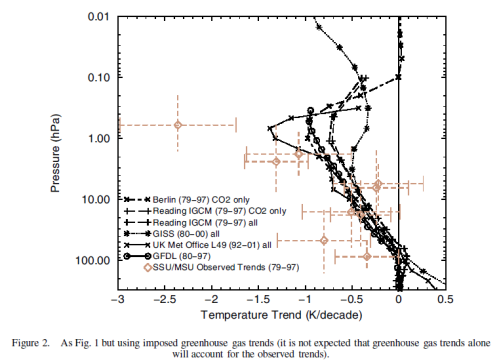 The paper does illustrate the non-linear effect of various climate mechanisms. It shows that small, almost unnoticed, influencers can have a large effect on climate. It is therefore not clear whether the stratospheric water vapor changes represent a feedback to global average climate change or a source of decadal variability. Current global climate models suggest that the stratospheric water vapor feedback to global warming due to carbon dioxide increases is weak, but these models do not fully resolve the tropopause or the cold point, nor do they completely represent the QBO, deep convective transport and its linkages to SSTs, or the impact of aerosol heating on water input to the stratosphere. This work highlights the importance of using observations to evaluate the effect of stratospheric water vapor on decadal rates of warming, and it also illuminates the need for further observations and a closer examination of the representation of stratospheric water vapor changes in climate models aimed at interpreting decadal changes and for future projections. Given that the modeled changes add up to 70% on top of CO2 radiative forcing in an earlier period and then reduce CO2 radiative forcing by 40% in a later period, this is a very significant effect. I expect that uncovering the mechanisms behind stratospheric water vapor change is an area of focus for the climate science community. 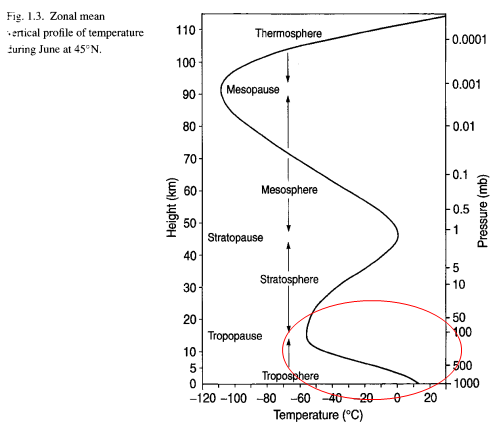 More on climate basics.. Why is the lower atmosphere – the troposphere – like it is? As a “conceptual idea” to help understand this, the pressure at any level is dependent on the total weight of atmosphere above. As you go up higher in the atmosphere the weight above decreases. 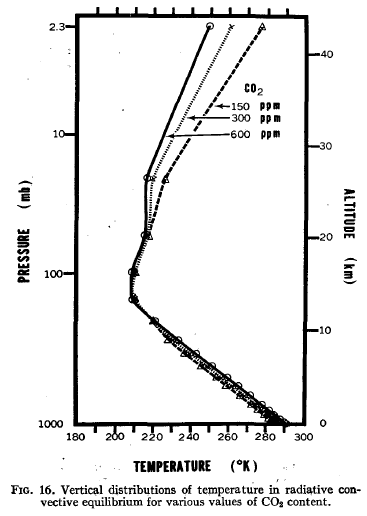 As the weight above decreases, the atmosphere below is less “compressed” due to the pressure and so the pressure change is not linear with altitude. There is some maths at the end for people interested. The temperature decreases with altitude through the troposphere. What explains this? Firstly, the atmosphere is mostly transparent to solar radiation so the solar radiation passes straight through the atmosphere and is absorbed by the surface – whether land or sea. Secondly, the surface heats up because of this radiation and consequently warms the lower atmosphere. 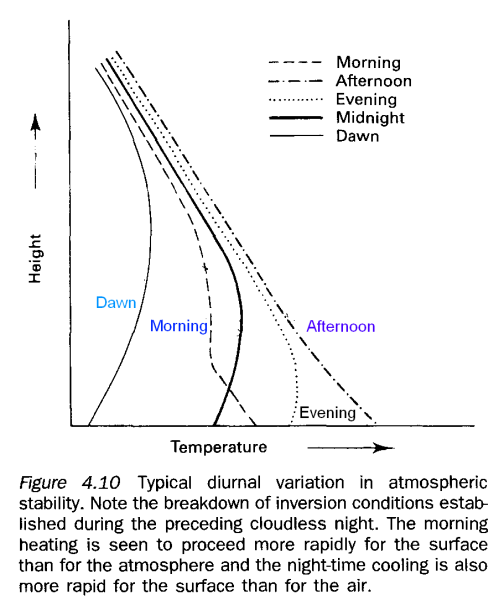 What we need to understand is the dominant mechanism by which it heats the lower atmosphere. If we calculate the movement of heat upward through the atmosphere only by radiation (the atmosphere absorbs and emits longwave radiation) we find a vertical temperature profile which doesn’t match what we observe. When the atmosphere is “optically thick”, radiation doesn’t provide a good “re-distribution” of heat. In the troposphere, if radiation was the only mechanism for moving heat, the “lapse rate” – or change of temperature with height – would be more than 10K/km. As we go up through the troposphere the temperature decreases with altitude. This introduces terminology problems with “more than” and “less than” (especially if we are trying to avoid maths). More rigorously I could say that the temperature change would be less than -10K/km. E.g. -12K/km. And yet, the actual environmental lapse rate is around -6.5K/km. The “environmental lapse rate” is what we observe in practice. Now radiation is only one mechanism for moving heat – the others are conduction and convection. Convection is a very effective mechanism for redistributing heat. The sun heats the earth’s surface (through the almost transparent atmosphere) – the earth’s surface heats the lowest levels of the atmosphere via conduction and convection. What happens to air that is heated? If air heats it expands, and if it expands then its density becomes lower and so it will rise. The first law of thermodynamics – conservation of energy – says that if there is no change in energy then work done by a parcel of air in expanding must equal the change in heat. This means that for dry air we can easily calculate the temperature change as air rises. The adiabatic lapse rate of dry air is -9.8K/km (=-9.8°C/km). Calculating the value for moist air is not so simple (but is still basic physics) and depends on the humidity. First, let’s use the dry lapse rate to consider what might happen in the atmosphere. Suppose the temperature profile has been determined by radiative equilibrium, and is therefore more than 10K/km. So if the surface is 15°C, then 1km up the temperature will be less than 5°C, and 2km up the temperature will be less than -5°C. If a parcel of dry air at the surface moves upward 1km then as a result of the change in energy in expanding it will reach a temperature of just over 5°C. It will be warmer than the equilibrium profile that has been established by radiation. This means it will be less dense than the surrounding air and so it will keep on rising. Therefore, in practice, any dry air which is slightly perturbed vertically will find itself warmer than the surrounding air and will keep on rising. So convection dominates the temperature profile of the lower atmosphere. If radiative equilibrium dominated, convection would quickly take over – because it is more effective at moving heat in the troposphere (a different story in the stratosphere). Now let’s consider humid air. As air cools it can hold less water vapor. So water vapor will condense, thereby releasing heat. Therefore, the more humid the air, the warmer it will be at higher altitudes (because of release of latent heat). And so, humid air has a lapse rate which is “less negative” than dry air. This value can be as “low” as -4K/km in the tropics. And on average the “environmental” lapse rate is -6.5K/km. Convection determines the temperature profile in the troposphere. But radiation is the only mechanism for moving heat into and out of the earth’s climate system. Radiation is also still very important in moving heat from the surface as can be seen in Sensible Heat, Latent Heat and Radiation. It’s common to see “criticisms” on blogs that somehow “climate science has ignored convection and latent heat”. Atmospheric physics 101 always works through these basics to explain the temperature profile of the troposphere. Convection, latent heat and radiation are all important movers of heat from the surface into the atmosphere. And in the case of radiation, it is also an important mover of heat back to the surface from the atmosphere. But convection is what determines the actual temperature profile of the lower atmosphere – the troposphere. 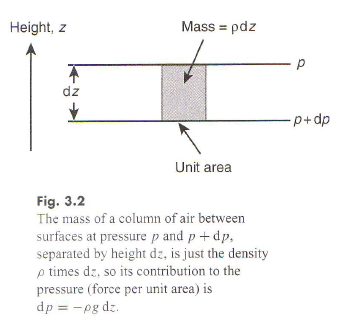 To understand pressure vs altitude we use the hydrostatic balance equation. H is dependent on temperature and therefore on the altitude, but as a very rough and ready approximation H doesn’t change too much. At the surface H = 8.5km and at the top of the mesosphere, H= 5.8km. The value of H tells us the change in altitude needed to reduce p (pressure) to 1/e (36%) of its original value. 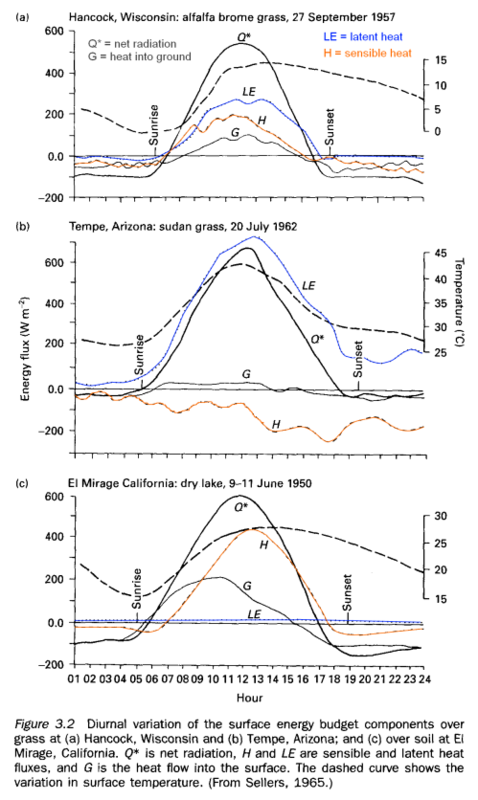 In 1967 Journal of Atmospheric Sciences published the paper: Thermal Equilibrium of the Atmosphere with a Given Distribution of Relative Humidity by Manabe and Wetherald. Can this be true? How can “greenhouse” gases reduce temperature? Is this another “global warming causes more snow storms” type story? First, a little about the stratosphere. The stratosphere is the region of the atmosphere from around 10km to 50km. In pressure terms it’s the pressure between about 200mbar and 1mbar. Ultraviolet radiation is almost completely absorbed in the stratosphere. The high energy photons of wavelength less than 0.24μm can break up molecular oxygen, O2, into atomic oxygen, O+O. O2 and O combine to create O3, or ozone, which is again broken up with absorption of more ultraviolet. Ozone production is greatest at a height around 25km. At higher levels, there are too few oxygen molecules to intercept all of the photons. At lower levels, there are few high energy photons left. The reason why the troposphere (lower atmosphere) warms from the bottom is that once the UV is absorbed the atmosphere is mostly transparent to the rest of the solar radiation. Therefore, the radiation passes straight through and is absorbed by the earth’s surface, which warms up and consequently warms the atmosphere from beneath. Air that warms expands, and so rises, causing convection to dominate the temperature profile of the lower atmosphere. By contrast, the stratosphere is warmer at the top because of the effect of solar absorption by O2 and O3. If there was no absorption by O2 or O3 the stratosphere would be cooler at the top (as it would only be heated from underneath by the troposphere). Just about everyone has heard about ozone depletion in the stratosphere due to CFCs (and other chemicals). Less ozone must also cause cooling in the stratosphere. This is easier to understand than the model results at the beginning (from increased “greenhouse” gases). Less ozone means less ability to absorb solar radiation. 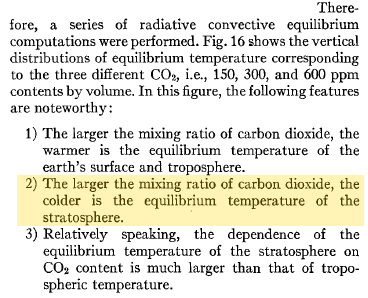 If less energy is absorbed, then the equilibrium stratospheric temperature must be lower. Temperature measurements of the stratosphere are limited. We have satellite data since 1979 which doesn’t provide as much vertical resolution as we need. We have radiosonde data since the 1940s which is limited geographically and also is primary below 30hPa (around 25km). Lots of painful work has gone into recreating temperature trends by height/pressure and by latitude. For example, in the 2001 review paper by Ramaswamy and many co-workers (reference below), the analysis/re-analysis of the data took 23 of the 52 pages. Before explaining why more CO2 and other trace gases could cause “stratospheric cooling”, it’s worth looking at the model results to understand the expected temperature effects of less ozone – and more CO2. Notice that in the 1967 paper the predicted temperature drop was larger the higher up in the stratosphere. The effects of ozone are more complex and also there is more uncertainty in the ozone trends because ozone depletion has been more localized. Note that the effect of ozone depletion has a projected peak cooling around 1hPa (50km) and a second peak cooling around 80hPa. The model results are a reasonable match with the observed trends – but a long way off perfect. 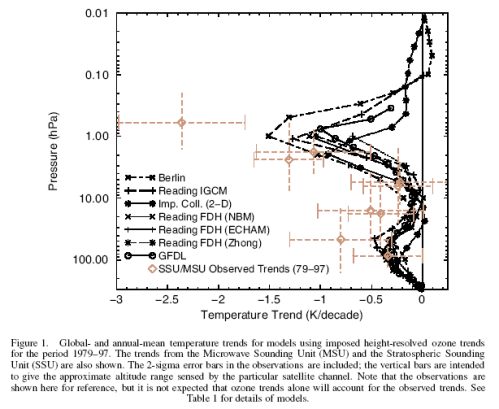 By “reasonable match” I mean that they reproduce the general trends of decadal cooling vs height. There are many uncertainties in the observations, and there are many uncertainties in the changes in concentration of stratospheric ozone and stratospheric water vapor (but not so much uncertainty about changes in the well-mixed “greenhouse” gases). None of these potential explanations is compelling and so the possibility remains that the discrepancy is real, which would indicate that there is a temperature trend mechanism missing from the models. Nonetheless, assuming that at least some part of this discrepancy is real, one possible explanation is stratospheric water vapour changes. 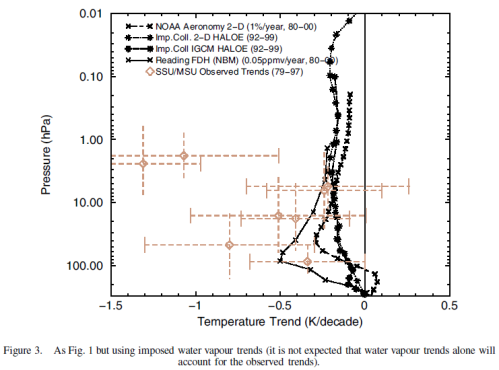 Figure 3 indicates that an extra cooling of a few tenths of a K/decade would result if the Boulder sonde-based water vapour trends were used rather than the HALOE water vapour trends. If this were one explanation for the model–observation difference, water vapour could dominate over ozone as the main cause of temperature trends in this altitude region. 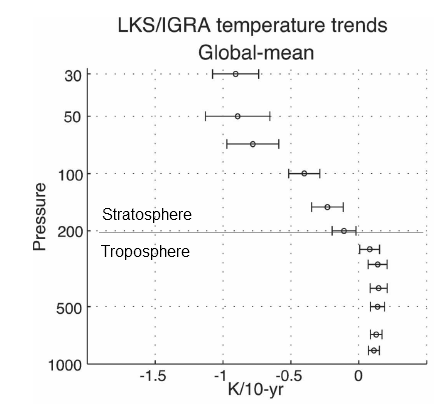 Why Is the Stratosphere Expected to Cool from Increases in “Greenhouse” Gases? This is a difficult one to answer with a 30-second soundbite. You can find a few “explanations” on the web which don’t really explain it, and others which appear to get the explanation wrong. The simplest approach to explaining it is to say that the physics of absorption and emission in the atmosphere – when calculated over a vertical section through the atmosphere and across all wavelengths – produces this result. That is – the maths produces this result..
You can see an introduction to absorption and re-emission in CO2 – An Insignificant Trace Gas? Part Three. [Note added to this article much later, the series Visualizing Atmospheric Radiation has an article Part Eleven – Stratospheric Cooling – from January 2013 on why the stratosphere is expected to cool as CO2 increases. It is quite involved but shows the detailed mechanism behind stratospheric cooling]. After all, this approach is what led Manabe and Wetherald to their results in 1967. But of course, we all want to understand conceptually how an increase in CO2 – which causes surface and troposphere warming – can lead to stratospheric cooling. 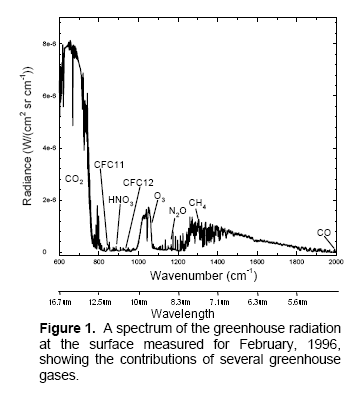 As we mentioned earlier, in our explanation of the greenhouse effect, OLR reduces (with an increase in CO2) because of the decrease in temperature with altitude. In the stratosphere, however, temperature increases with altitude and as a result the cooling to space is larger than the absorption from layers below. This is the fundamental reason for the CO2 induced cooling. For carbon dioxide the main 15-um band is saturated over quite short distances. Hence the upwelling radiation reaching the lower stratosphere originates from the cold upper troposphere. When the CO2 concentration is increased, the increase in absorbed radiation is quite small and the effect of the increased emission dominates, leading to a cooling at all heights in the stratosphere. Are they saying the same thing? Yes (probably). If these explanations help – wonderful. If they don’t, refer to the maths. That is, the mathematical result provides this solution and overall “hand waving” explanations are only ever a second-best “guide”. Also check out The Earth’s Energy Budget – Part Three for explanations about emissions from various levels in the atmosphere. 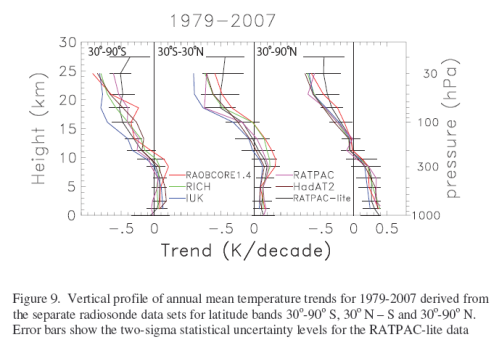 Understanding stratospheric temperature trends is a difficult challenge. Understanding the mechanisms behind this changes is much more of a conceptual challenge. But over 40 years ago, it was predicted that the upper stratosphere would cool significantly from increases in CO2. The depletion of ozone is also predicted to have an effect on stratospheric temperatures – in the upper stratosphere (where CO2 increases will also have the most effect) and again in the lower stratosphere where ozone is the dominant factor. Stratospheric water vapor also has an effect in the lower stratosphere (where more water vapor leads to more warming and vice-versa), but more on this in a later post. For some, who feel/believe that CO2 can’t really significantly affect anything in climate – this post isn’t for you – check out the CO2 – An Insignificant Trace Gas? series. There will be others who will say “Ozone is the reason the upper stratosphere has cooled“. True, but increases in CO2 are also an important factor. The same calculations (maths and physics) that lead to the conclusion that less ozone will cool also lead to the conclusion that more CO2 will cool the upper stratosphere. This subject also has two other possible consequences. One is about attribution. Global temperatures have increased over the last 40 years and many people want to understand the cause. 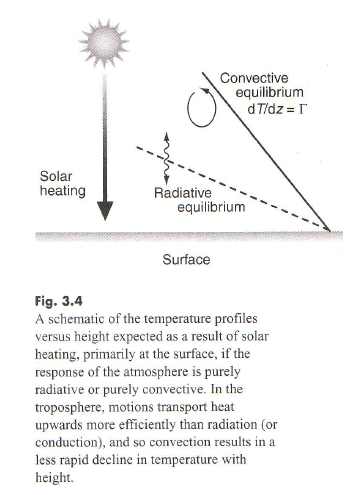 If solar heating was the direct cause (see Here Comes the Sun) the stratosphere would not be cooling. However, other effects could possibly also cause stratospheric cooling at the same time as tropospheric and surface heating. It’s a complex subject. But something to question for those other potential causes – would they also cause stratospheric cooling? The other consequence is about GCMs. Some say that stratospheric cooling is a “vindication” of GCMs. In so far as we have covered the subject in this post we couldn’t reach that conclusion. The modeling of tropospheric and stratospheric temperature profiles can be done (and was by Manabe and Wetherald) with 1D radiative-convective models. Certainly 3d GCMs have also been used to calculate the effect by latitude but these results have more issues – well, the whole subject is much more complex because the change of ozone with height and latitude are not well understood. But it is important to understand the difference between a GCM solving the general climate problem and a more constrained mathematical model solving the temperature profile against height through the atmosphere. 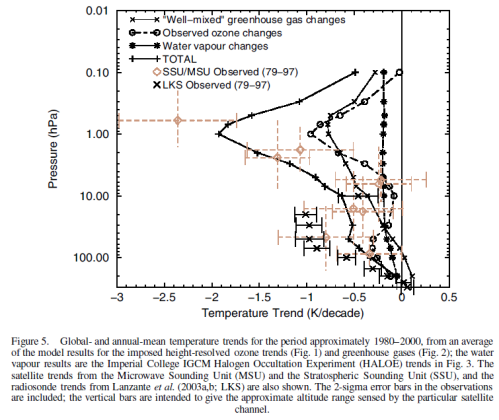 However, stratospheric cooling while the surface and troposphere are warming does indicate that CO2 and other “greenhouse” gases are likely influencers. Many questions have recently been asked about the relative importance of various mechanisms for moving heat to and from the surface, so this article covers a few basics. I added some color to help pick out the different elements, note that temperature variation is also superimposed on the graph (on its own axis). The blue line is net longwave radiation. Note that the night-time is not shown, which is why the net radiation is almost always positive. You can see that the downward longwave radiation measured from the sky (in clear violation of the Imaginary Second Law of Thermodynamics) doesn’t change very much – equally so for the upwards longwave radiation from the ground. You can see the terrestrial (upwards longwave) radiation follows the temperature changes – as you would expect. “Sensible” heat is that caused by conduction and convection. For example, with a warm surface and a cooler atmosphere, at the boundary layer heat will be conducted into the atmosphere and then convection will move the heat higher up into the atmosphere. Latent heat is the heat moved by water evaporating and condensing higher up in the atmosphere. Heat is absorbed in evaporation and released by condensation – so the result is a movement of heat from the surface to higher levels in the atmosphere. Heat flux into the ground is usually low, except into water. All of these observations were made under clear skies in light to moderate wind conditions. Note the low latent heat for the dry lake – of course. The negative sensible heat in Arizona (2nd graphic) is because it is being drawn from the surface to evaporate water. It is more usual to see positive sensible heat during the daytime as the surface warms the lower levels of the atmosphere. The latent heat is higher in Arizona than Wisconsin because of the drier air in Arizona (lower relative humidity). The ratio of sensible heat to latent heat is called the Bowen ratio and the physics of the various processes mean that this ratio is kept to a minimum – a moist surface will hardly increase in temperature while evaporation is occurring, but once it has dried out there will be a rapid rise in temperature as the sensible heat flux takes over. We can see that heat doesn’t get very far into soil – because it is not a good conductor of heat. The rate of heat penetration (e.g. into the soil) is dependent on the thermal diffusivity. This is a combination of two factors – the thermal conductivity (how well heat is conducted through the substance) divided by the heat capacity (how much heat it takes to increase the temperature of the substance). Why is still water so similar to dry sand? Water has 4x the ability to conduct heat, but also it takes almost 4x as much heat to lift the temperature of water by 1°C. Note that stirred water is a much better conductor of heat – due to convection. The same applies to air, even more so – “stirred” air (= moving air) conducts heat a million times more effectively than still air. I’ll cover more about temperature profiles in a later article about why the troposphere has the temperature profile it does. During the day the ground is being heated up by the sun and by the longwave radiation from the atmosphere. Once the sun sets, the ground cools faster and starts to take the lower levels of the atmosphere with it. Just some basic measurements of the various components that affect the surface temperature to help establish their relative importance. This post covers a dull subject. If you are new to Science of Doom, the subject matter here will quite possibly be the least interesting in the entire blog. At least, up until now. It’s possible that new questions will be asked in future which will compel me to write posts that climb to new heights of breath-taking dullness. So commenters take note – you have a duty as well. And new readers, quickly jump to another post.. In an earlier post – Why Global Mean Surface Temperature Should be Relegated, Or Mostly Ignored – we looked at the many problems of trying to measure the surface of the earth by measuring the air temperature a few feet off the ground. And also the problems encountered in calculating the average temperature by an arithmetic mean. (An arithmetic mean for those not familiar with the subject is the “usual” and traditional averaging where you add up all the numbers and divide by how many values you had). We looked at an example where the average temperature increased, but the amount of energy radiated went down. Energy radiated out would seem to be a more useful measure of “real temperature” so clearly arithmetic averages of temperature have issues. This is how GMST is calculated – well not exactly, as the values are area-weighted, but there is no factoring in of how surface temperature affects energy radiated. But in the discussion someone brought up emissivity and what effect it has on the calculation of energy radiated. So in the interests of completeness we arrive here. So what are the non-black body corrections required for the initial calculation 396W/sqm? And what are the corrections for the equivalent temperature calculation? And do they cancel out (I think not due to the non-linearity issue) ? What’s this about? (Of course, read the earlier post if you haven’t already). where T is absolute temperature (in K), σ=5.67×10-8 and ε is the emissivity. ε is a value between 0 and 1, and 1 is the “blackbody”. The value – very important to note – is dependent on wavelength. So the calculations I showed (in the thought experiment) where temperature went up but energy radiated went down need adjustment for this non-blackbody emissivity. Here we consult the “page-turner”, Surface Emissivity Maps for use in Satellite Retrievals of Longwave Radiation by Wilber (1999). And yet more graphs at the end of the post – spreading out the excitement.. 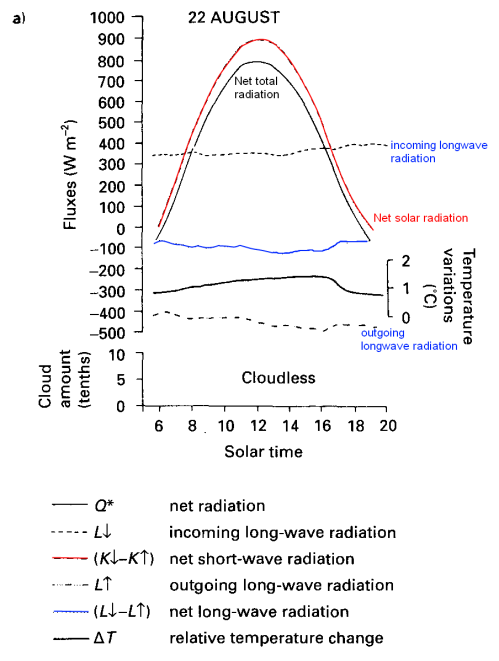 Note the key point, in the wavelengths of interest emissivity is close to 1 – close to a blackbody. For beginners to the subject, who somehow find this interesting and are therefore still reading, the wavelengths in question: 4-30μm are the wavelengths where most of the longwave radiation takes place from the earth’s surface. Check out CO2 – An Insignificant Trace Gas? for more on this. 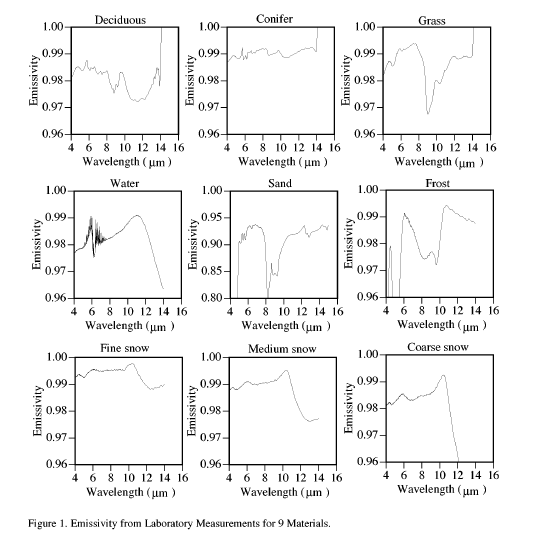 I did wonder why the measurements weren’t carried on to 30μm and as far as I can determine it is less interesting for satellite measurements – because satellites can see the surface the best in the “atmospheric window” of 8-14μm. So with the data we have we see that generally the value is close to unity – the earth’s surface is very close to a “blackbody”. Energy radiated in 4-16μm wavelengths only account for 50-60% of the typical energy radiated from the earth’s surface, so we don’t have the full answer. Still with my excitement already at fever pitch on this topic I think others should take on the task of tracking down emissivity of representative earth surface types at >16μm and report back. So we have some ideas of emissivities, they are not 1, but generally very close. How does this affect the calculation of energy radiated? The average temperature, or “global mean surface temperature” = 14°C. The average temperature, or “global mean surface temperature” = 14.3°C. Because we are calculating the total energy we are simply adding up the energy value from each area. All the emissivity does is weight the energy from each location. So once again the energy radiated has gone down, even though the GMST has increased. If we change around the emissivities, so that ε=0.8 for Equatorial & Sub-Tropics, while ε=0.99 for Mid-Latitude and Polar regions, the GMST values are the same. So the temperature has gone up and the energy radiated has also gone up. Therefore, emissivity does change the situation a little. I chose more extreme values of emissivity than are typically found to see what the effect was. The result is not complex or non-linear because emissivity simple “weights” the value of energy making it more or less important as the emissivity is higher or lower. In the second example above, if the magnitude of temperature changes was slightly greater in the polar and equatorial regions this would be enough to still show a decrease in energy while “GMST” was increasing. Emissivity in the wavelengths of interest for the earth’s radiation is generally very close to 1. Assuming “blackbody” radiation is a reasonable assumption for most calculations of interest – as other unknowns are typically a higher source of error. Because the earth’s surface has been mapped out and linked to the emissivities, if a particular calculation does need high level accuracy the emissivities can be used. In the terms of how emissivity changes the “surprising” result that temperature can increase while energy radiated decreases – the answer is “not much”. In On Having a Laugh – by Gerlich and Tscheuschner (2009) I commented that I had only got to page 50 and there were 115 pages in total. Because there were so many errors already spotted, none central to the argument (the argument hadn’t started even at page 50), it seemed a pointless exercise to read it further. After all, many interesting papers await, on the thermohaline circulation, on models, on stratospheric cooling..
Perhaps most important of the criticisms was that Gerlich and Tscheuschner didn’t appear at all familiar with the climate science they were “debunking” – instead of commenting on encyclopedia references or throwaway comments in introductions to works unrelated to proving the inappropriately-named “greenhouse effect” they should be commenting on papers like Climate Modeling through Radiative-Convective Models by Ramanathan and Coakley (1978). However, after noticing that a recent commenter actually cited Gerlich and Tscheuschner I went back and reviewed their paper. And in doing so I realized that many many misinformed comments by enthusiastic people on other popular blogs, and also this one, were included in the ground-breaking On Falsification Of The Atmospheric CO2 Greenhouse Effects by Gerlich and Tscheuschner. It’s possible that rather than enthusiastic commenters obtaining misinformation from our duo that instead our duo have combined a knowledge of theoretical thermodynamics with climate science that they themselves obtained from blogs. The question of precedence is left as an exercise for the interested reader. It is hard to know where to start with this paper because there is no logical flow. The paper begins by reviewing the conductivity of various gases. It is obvious that a doubling of the concentration of the trace gas CO2, whose thermal conductivity is approximately one half than that of nitrogen and oxygen, does change the thermal conductivity at the most by 0.03% and the isochoric thermal diffusivity at the most by 0.07 %. These numbers lie within the range of the measuring inaccuracy and other uncertainties such as rounding errors and therefore have no significance at all. Clearly conductivity is the least important of means of heat transfer in the atmosphere. Radiation, convection and latent heat all get a decent treatment in studies of energy balance in the atmosphere. If our duo had even read one book on atmospheric physics, or one central paper they would be aware of it. Uninformed people might conclude from this exciting development that they have already demonstrated something of importance rather than just agreeing wholeheartedly with the work of atmospheric physicists. Pseudo-Explanations to be Revealed in Part Two? Or Left as an Exercise for the Interested Student? The constant appearing in the T4 law is not a universal constant of physics. It strongly depends on the particular geometry of the problem considered. Many pseudo-explanations in the context of global climatology are already falsified by these three fundamental observations of mathematical physics. Unfortunately they don’t explain which ones. The climate science world waits with baited breath..
For instance, to compute the radiative transfer in a multi-layer setup, the correct point of departure is the infinitesimal expression for the radiation intensity, not an integrated Stefan-Boltzmann expression already computed for an entirely divergent situation. Sadly they are unfamiliar with the standard works in the field of the radiative-convective model. In any case, a larger portion of the incoming sunlight lies in the infrared range than in the visible range. In most papers discussing the supposed greenhouse effect this important fact is completely ignored. First, a comment on the “benefit” of this miseducation – being able to separate out solar radiation from terrestrial radiation is a huge benefit in climate understanding – it allows us to measure radiation at a particular wavelength and know its source. But many people are confused and say we can’t because 50% of the solar radiation is “infrared”. Infrared means >0.7μm. Conventionally, climate scientists use “shortwave” to mean radiation < 4μm and “longwave” to mean radiation > 4μm. As less than 1% of solar radiation is >4μm this is a very useful convention. Any radiation greater than 4μm is terrestrial (to 99% accuracy). Many uninformed people who have become miseducated are certain that much solar radiation is >4μm – possibly due to confusing infrared with longwave. We don’t speculate on motives on this blog so I’ll just point out that Gerlich and Tscheuschner know very little about any climate science, and from this comment probably don’t even understand the inappropriately-named “greenhouse” effect. Why? Well, what has the visibility of the radiation have to do with the “greenhouse” effect? Of course it’s ignored. Our duo are just demonstrating their ignorance of the absolute basics. Or they have some amazing insight into how the visibility or not of solar radiation affects the radiative transfer equations. All to be shared in part two probably..
LTE [local thermodynamic equilibrium] does only bear a certain significance for the radiation transport calculations, if the absorption coefficients were not dependent on the temperature, which is not the case at low temperatures. Nevertheless, in modern climate model computations, this approach is used unscrupulously. We have no idea what anyone does but we read somewhere that stuff wasn’t done right..
Or they could actually show what effect that dependency actually had.. The integrations for the separate directions are independent of one another. In particular, the ones up have nothing to do with the ones down. It cannot be overemphasized, that differential equations only allow the calculation of changes on the basis of known parameters. The initial values (or boundary conditions) cannot be derived from the differential equations to be solved. In particular, this even holds for this simple integral. What do they mean? Of course you need boundary conditions to solve all real-world equations. The separate directions are independent of one another? Yes, you find that in all treatments of radiative transfer. So Gerlich and Tscheuschner agree that the RTE can be used to solve the problem? Or not? No one can tell from the comments here. If they do, the paper should be over now with support for the inappropriately-named “greenhouse effect”, unless they demonstrate that they can solve them for the atmosphere and get a different result from everyone else. Fortunately for those interested in what our duo really know and understand – they tell us..
Callendar and Keeling, the founders of the modern greenhouse hypothesis, recycled Arrhenius’ discussion of yesterday and the day before yesterday by perpetuating the errors of the past and adding lots of new ones. In the 70s and 80s two developments coincided: A accelerating progress in computer technology and an emergence of two contrary policy preferences, one supporting the development of civil nuclear technology, the other supporting Green Political movements. Suddenly the CO2 issue became on-topic, and so did computer simulations of the climate. The research results have been vague ever since. No explanation of Callendar and Keeling’s mistakes – this is left as an exercise for the interested student. And no mention of the critical work in the 1960s and 1970s which used the radiative transfer equations and the convective structure of the atmosphere to find the currently accepted solutions. In fact, the research results haven’t been vague at all. Regular readers of this blog will know about Ramanathan and Coakley 1978, and there are many more specific papers which find solutions to the RTE – using boundary conditions and separation of upward and downward fluxes, as wonderfully endorsed by our comedic duo. More recent work has of course refined and improved the work of the 1960s and 1970s. And the measurements match the calculations. But what a great way to write off a huge area of research. Show some flaws in the formative work 100 or so years ago and then skip the modern work and pretend you have demonstrated that the modern theory is wrong. As we saw in the last section, our duo appear to support the modern equations – although they are careful not to come out and say it. Luckily, they are blissfully ignorant of modern work in the field, which all helps in the miseducation of the uninformed. The main work of the paper should now be over, but our duo haven’t realized it. So instead they move randomly to the radiative balance concept.. 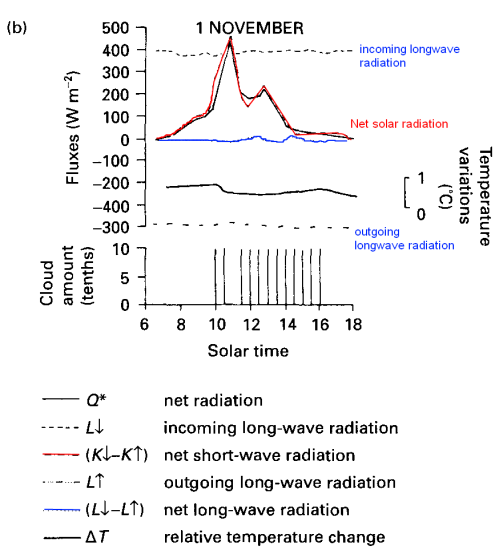 In every introduction to atmospheric physics you find the concept of radiative balance – solar energy absorbed = terrestrial radiation emitted from the top of the atmosphere. These concepts are used to demonstrate that the atmosphere must absorb longwave (terrestrial) radiation. In summary, the factor 0.7 will enter the equations if one assumes that a grey body absorber is a black body radiator, contrary to the laws of physics. Other choices are possible, the result is arbitrary. Being obscure impresses the uninformed. However, the informed will know that the earth’s emissivity and absorptivity will of course be different because the solar radiation is centered on 0.5μm while the terrestrial radiation is centered on 10μm. And the emissivity (and absorptivity) around 10um is very close to 1 (typically 0.98) while around 0.5μm the absorptivity is somewhat lower. At this point, if we were to do a parody of our duo, we would write how their physics is extremely poor and do a three page derivation of absorptivity and emissivity as a function of wavelength. What they are saying is that for energy balance if we work out the radiation emitted from the earth we have dealt with the problem. Fortunately for our intrepid duo, they are unacquainted with any contemporary climate science so the fact that someone has already done this work can be safely ignored. Earth’s Global Energy Budget by Trenberth, Fassulo and Kiehl (2008) covers this work. To compute these effects more exactly, we have taken the surface skin temperature from the NRA at T62 resolution and 6-hour sampling and computed the correct global mean surface radiation from (1) as 396.4 W/m2. If we instead take the daily average values, thereby removing the diurnal cycle effects, the value drops to 396.1 W/m2 or a small negative bias. However, large changes occur if we first take the global mean temperature. In that case the answer is the same for 6 hourly, daily or climatological means at 389.2 W/m2. Hence the lack of resolution of the spatial structure leads to a low bias of about 7.2 W/m2. Indeed, when we compare the surface upward radiation from reanalyses that resolve the full spatial structure the values range from 393.4 to 396.0 W/m2. 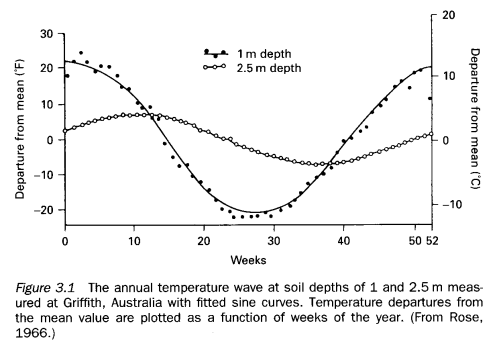 The surface emissivity is not unity except perhaps in snow and ice regions, and it tends to be lowest in sand and desert regions, thereby slightly offsetting effects of the high temperatures on longwave (LW) upwelling radiation. It also varies with spectral band (see Chédin et al. 2004 for discussion). Wilber et al. (1999) estimate the broadband water emissivity as 0.9907 and compute emissions for their best estimated surface emissivity versus unity. Differences are up to 6 W/m2 in deserts, and can exceed 1.5 W/m2 in barren areas and shrublands. So there is potential variation of a few W/m2 depending on the approach, and Trenberth et al settles on 396 W/m2 average – at least the values can be calculated, whereas our duo decided it was computationally impossible – perhaps as they saw the problem as requiring a totally accurate GCM. With this information, the radiative balance problem can be resolved and we can see that there is a discrepancy between the solar energy absorbed and the terrestrial radiation emitted which requires explanation. The inappropriately-named “greenhouse effect”. Without this information we can delight in much maths and pretend that nothing can be known about anything. In many climatological texts it seems to be implicated that thermal radiation does not need to be taken into account when dealing with heat conduction, which is incorrect. Rather, always the entire heat flow density q must be taken into account.. It is inadmissible to separate the radiation transfer from the heat conduction, when balances are computed.. Unfortunately, the work on even the simplest examples of heat conduction problems needs techniques of mathematical physics, which are far beyond the undergraduate level. In fact in many texts on atmospheric physics conduction is safely ignored due to the very low value of heat conduction through gases. Strictly speaking, if we write an equation then all terms should be included, including latent heat and convection. Why just radiation and conduction? 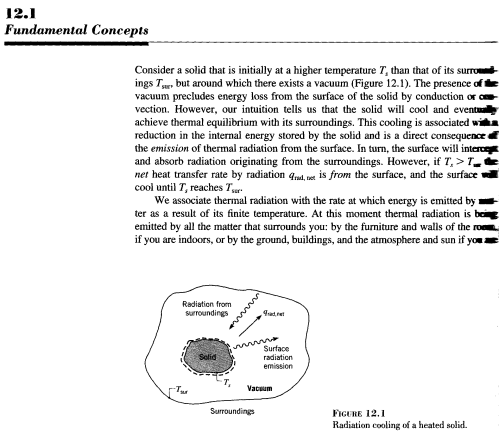 As Ramanathan and Coakley pointed out in their 1978 paper, convection is what determines the temperature gradient of the atmosphere but solving the equations for convection is a significant problem – so the radiative convective approach is to use the known temperature profile in the lower atmosphere to solve the radiative transfer equations. Still, no thought of conduction as that term is so insignificant – as our intrepid duo go on to realize.. If the radius of the Moon were used as the characteristic length and typical values for the other variables, the relaxation time would be equivalent to many times the age of the universe. Therefore, an average ground temperature (over hundreds of years) is no indicator at all that the total irradiated solar energy is emitted. If there were a difference, it would be impossible to measure it, due to the large relaxation times. At long relaxation times, the heat flow from the Earth’s core is an important factor for the long term reactions of the average ground temperature; after all, according to certain hypotheses the surfaces of the planetary bodies are supposed to have been very hot and to have cooled down. These temperature changes can never be separated experimentally from those, which were caused by solar radiation. So heat flow by conduction is so low that achieving balance by this method will take more than the age of the universe. Therefore, it is insignificant in comparison with convection and radiation. Good so we can move on and climate scientists are right to ignore it. Was that the point that Gerlich and Tscheuschner were making? Yes, although possibly without realizing it.. In their almost concluding section we see where countless climate enthusiasts have obtained their knowledge (or the reverse). As can be seen in the text, radiation can be absorbed by a higher temperature surface from a lower temperature surface and vice versa. 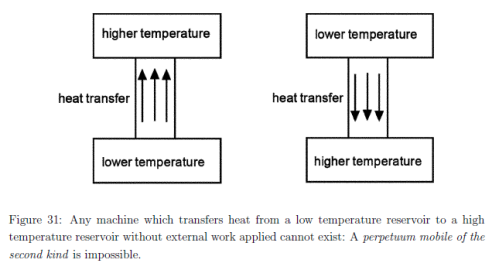 Of course, the net result is a heat transfer from the hotter to the cooler. The same uncontroversial description can be found in any standard thermodynamics work, unless they consider it too unimportant to mention. Certainly, none will have a warning sign up saying “this doesn’t happen”. The explanation of the “greenhouse effect” is that the earth’s surface warms the lower atmosphere by radiation (as well as convection and latent heat transfer). And the atmosphere in turn radiates energy in all directions – one of which is back to the earth’s surface. Believers in the imaginary second law of thermodynamics don’t think this can happen. And this is possibly due to the miseducation by our intrepid duo. Or perhaps they learnt their thermodynamics from many “climate science” blogs. The result of the actual climate situation is that the earth’s surface is warmer than it would have been without this atmospheric radiation. Pretty simple in concept. Now the confusion. What are they saying? This isn’t what atmospheric physicists describe. The net heat transfer is from the earth’s surface (which was warmed by the sun) to the atmosphere. Some `sceptics’ state that the greenhouse effect cannot work since (according to the second law of thermodynamics) no radiative energy can be transferred from a colder body (the atmosphere) to a warmer one (the surface). However, the second law is not violated by the greenhouse effect, of course, since, during the radiative exchange, in both directions the net energy flows from the warmth to the cold. Rahmstorf’s reference to the second law of thermodynamics is plainly wrong. The second law is a statement about heat, not about energy. Furthermore the author introduces an obscure notion of “net energy flow”. The relevant quantity is the “net heat flow”, which, of course, is the sum of the upward and the downward heat flow within a fixed system, here the atmospheric system. It is inadmissible to apply the second law for the upward and downward heat separately redefining the thermodynamic system on the fly. Our duo first attempt to confuse, as they frequently do in their opus by claiming that a clear explanation is obscure because precise enough terms aren’t used. It’s not obscure because they make the “correction” themselves. Then add their masterstroke. It is inadmissible to apply the second law for the upward and downward heat separately redefining the thermodynamic system on the fly. What on earth do they mean? Our comedic duo are the ones separating the system into upward and downward heat, followed by an enthusiastic army on the internet. Everyone else considers net heat flow. As we saw in a standard work on thermodynamics, now in its 6th edition after two or three decades in print, there is no scientific problem with radiation from a colder to a hotter body – so long as there is a higher radiation from the hotter to the colder. At this point I wonder – should I revisit the library and scan in 20 thermodynamic works? 50? What would it take to convince those who have been miseducated by our intrepid duo? Perhaps Gerlich and Tscheuschner can now turn their attention to all of the unscientific text books like the one shown at the start of this section.. There is much to admire in Gerlich and Tscheuschner’s work. It can surely become a new standard for miseducation and we can expect its deconstruction by psychologists and those who study theories of learning. From a scientific point of view, there is less to admire. They have no understanding of modern climate science, content to dwell on works from over 100 years ago and ignoring any modern work. They appear to believe that the basis for the “greenhouse” effect is an actual greenhouse (as was covered in On Having a Laugh) even though no serious work on the subject relies on greenhouses. (Some don’t even mention it, some mention it to point out that the atmosphere doesn’t really work like a greenhouse). In fact, the serious work of the last few decades relies on the radiative transfer equations – equations apparently endorsed by our duo, although their comments are “obscure”. They take many other snipes at climate science by the approach of pointing out a term or dependency has been “neglected” (for example, like conduction through the atmosphere) without showing that the neglect has a significant impact – except in the case of conduction where (unwittingly?) they appear to show that conduction should definitely be ignored! Someone could take issue with even modern work on climate science by the fact that they ignore relativistic effects. And after 18 pages of unnecessary re-derivation of general relativity we find that “it’s therefore impossible to calculate this and the problem is insoluble“..
Well, although they haven’t read any modern climate science, it’s hard to see how they could be so confused about the application of the 2nd law of thermodynamics. According to their interpretation of the 2nd law of thermodynamics this can’t happen. No heat can flow from the colder atmosphere to the warmer surface as that would be a “perpetuum mobile” and therefore impossible. Where is it coming from Gerlich and Tscheuschner?